The Gettysburg Foundation, in conjunction with Steve Roy Art Restoration, conducted a thorough conservation of the iconic Lincoln sculpture that greets visitors entering the Gettysburg National Military Park Museum & Visitor Center. The sculpture was closed during the conservation, April 11-14, 2019. 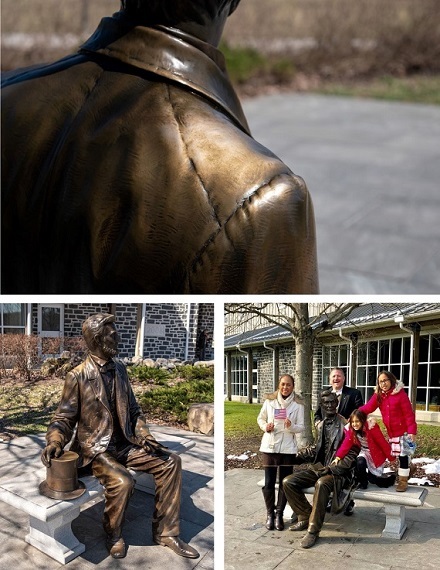 Created by sculptor, painter and inventor Ivan Schwartz, the bronze sculpture has welcomed millions of visitors to the Gettysburg National Military Park Museum & Visitor Center since 2009. The intricate conservation treatment required a specific three-step process. The metal was first heated to add a base layer patina before a solution was added to provide subtle, variegated brown coloration. The final step included an application of materials to darken the sculpture. Then several layers of paste wax were applied and buffed to give the sculpture a soft finish. “Preserving the powerful and contemplative sculpture will allow future generations of visitors to reflect on the enduring significance of Lincoln’s Gettysburg Address and the role of democracy,” said Elle Lamboy, Vice President of Philanthropy, Gettysburg Foundation. While the sculpture was closed, visitors had opportunities for photos with Mr. Lincoln. On April 12 and 13, visitors interacted and had photos taken with renowned Lincoln interpreter, George Buss. Buss has educated and entertained audiences with his portrayal of Lincoln for more than 30 years. Funds for the conservation treatment were raised during the Gettysburg Foundation’s Giving Tuesday campaign in November 2018. The campaign secured $20,900 for the conservation thanks to the efforts of nearly 200 Friends and supporters and a generous $10,000 matching grant from Linda H. Garrett, Friend of Gettysburg.